More than a million families are in deep debt, having borrowed at loan shark rates from microfinance companies. In one instance, a Batticaloa family headed by a woman, who had borrowed heavily from multiple lenders, was guided by local government officials to get out of the debt hole. Local officials advised her to borrow from the state-owned Samurdhi Bank. The woman borrowed Rs 475,000, and was able to settle some 12 outstanding loans taken from various companies. Her borrowings are also used to cover daily expenses and she has no income. So, she borrowed again, and had told the loan officer who came to collect weekly payments that she would end her life. There are thousands of desperate women like her who have borrowed from unregulated micro lenders and are unable to pay. The decision by the government to write off micro finance loans in 12 districts, is little relief to many families. For millions, the cycle of borrowing and debt, and more borrowing to debt, continues. Kaudulle Jayatissa, the president of Progressive Agrarian Association, a grassroots community organisation in the south, says the government decision to write off a select number families as recommended by micro finance companies is a sham. The decision had an election agenda. “According to our data, more than 2.4 million families headed by women are struggling with debt, but only 45,139 families were selected. This created more problems as many assumed that the government is going to write off their loans,” Mr Jayatissa told the Sunday Times. 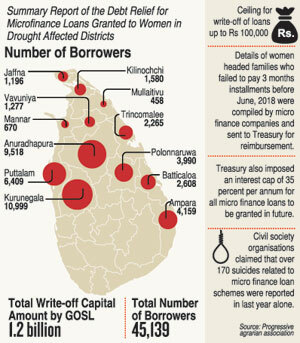 He said at least 170 suicides related to micro finance loans had been reported. Most suicides were in Jaffna, Batticaloa, Vavuniya and Ampara districts. He fears the number is much higher because some tragedies are not reported. Malathy Manoharan, a field researcher of community based organisation, Social Architects, of Akkarapattu in Ampara, said writing off loans is minor relief. “Many of the weekly loans were converted into monthly loans. In fact many institutions significantly reduced issuing loans and visiting residences after dark. However, nothing changed in the condition of the affected families,” Mrs Manoharan said. Social Architects is engaged in raising awareness in remote villages. Mrs Manoharan expressed concerns on how families were selected for relief based on the non payment of installments on loans three months in a row before June last year. She said local government officials such as Grama Sevakas should have been involved to identify deserving families. “Non payment for three consecutive months is not reasonable given that credit officers would have forced families to somehow pay at least one month in between. Some families moved to other areas fearing verbal abuse and intimidation by credit officers, who routinely visited their residences,” Mrs Manoharan said, while relating an incident where a woman had to hide in a domestic well to avoid officers from a loan shark company. Considering the severity of debt accumulated by vulnerable families, particularly families headed by women deeply affected by the worst drought in decades, the government decided to grant relief last year. Following Cabinet approval in August last year, 45,139 women headed households from 12 districts were identified and the Treasury agreed to pay Rs 1.25 billion to micro finance institutions in six phases over the next three years. An initial Rs 209 million was paid early this year. The capital is written off by the Treasury, but the interest on loans have to be borne by the enders. As requested by the Treasury, the registered micro finance companies and institutions registered under the Lanka Micro Finance Practitioners Association (LMFPA) were asked to compile details of borrowers who obtained loans of up to Rs 100,000 and failed to pay monthly installments for three consecutive months since June last year. The Treasury also imposed an interest cap of 35 percent a year for all micro finance loans. A study by the Central Bank of Sri Lanka and the Treasury revealed that some micro finance companies charged over 200 percent interest. For example, the leaflet of a micro finance company promised an instant loan of Rs 20,000 for repayment at Rs 400 per day over 60 days. “This has become a major social issue as a consequence of failing to address the urgent needs of the community following the end of the conflict 10 years ago,” said T. Saravanapavan, the mayor of Batticaloa Municipal Council. The council passed a resolution last year to stop micro lending by unregulated credit companies within the municipality limits. Mayor Saravanapavan also added that these micro finance companies are trying to lure more borrowers to achieve their monthly, or weekly targets. “That’s why we are focused on community awareness campaigns in remote villages which are targeted by these companies,” he said. LMFPA, an organisation of 38 registered micro finance companies called for strict regulation as many unregistered companies and non-governmental organisations (NGOs) entered into the industry with attractive financial loan schemes. LMFPA introduced a code of conduct for lenders last year. The president of LMFPA, Anil Atapattu, said some profit driven ventures under the cover of micro finance institutions was the reason that poor families fell into a debt trap. “Micro finance was meant to alleviate poverty in rural areas and empower locals in the first place. Profitability comes second. The minimum profitability was required to maintain the sustainability of those institutions. However, profit-driven ventures caused this scenario today,” he said. Mr Atapattu said that the Micro Finance Act 2016 has to be amended to ensure best practices are maintained as the current act is focused on deposit taking companies. Micro finance companies have begun to register with the Central Bank of Sri Lanka and Secretariat of NGOs. The lack of financial literacy is the main reason that people end up on the streets demanding government intervention after they fall prey to dubious financial institutions and financial scams, a financial professional says. In a public lecture on “What is financial literacy and why it is important?” at the Centre for Banking Studies of the Central Bank of Sri Lanka on Thursday, Ravi Abeysuriya, advocacy chair and director of CFA Society Sri Lanka, discussed ways to achieve financial independence. Sri Lanka’s financial literacy rate is below that of countries in the region, he says. He also pointed out that loan shark micro finance companies have had a huge adverse impact on families in rural villages. “When people face financial stress, their immediate reaction is to look for more money. They don’t understand that the root cause of their problem is low financial literacy,” he told to a packed audience on how they can improve their lifestyles by understanding “needs and wants’’. The seminar also discussed the need to cultivate proper financial planning before saving, or investing.